Justis Fearsson is a private investigator on the trail of a serial killer in Phoenix, Arizona. Justis is also a weremyste—a person with a wizard’s gifts and the ability to see into the paranormal world. Unfortunately, weremystes also tend to go crazy on the full moon—which is why Justis is no longer a cop. Hard to explain those absences as anything but mental breakdown. But now an old case from his police detective days has come back to haunt him, literally, as a serial killer known as the Blind Angel strikes again. His signature stroke: burning out the victims’ eyes with magic. Now the victims are piling up, including the daughter of a senator, and Justis must race to stop the Blind Angel before he, she, or it kills again. There’s only one clue he’s got to go on: the Blind Angel is using the most powerful magic Justis has ever encountered, and if he doesn’t watch his own magical step, he may end up just as dead as the other vics. 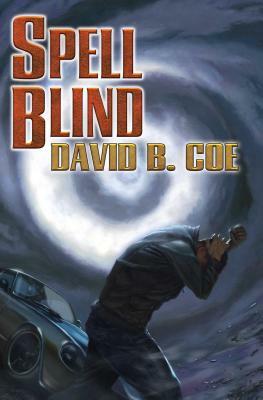 David B. Coe is the author of many fantasy and contemporary fantasy novels and stories. He was the winner of the William L. Crawford Award for best first fantasy series, awarded at the International Conference on the Fantastic and is a founding members of the well-regarded writing blog, MagicalWords.net. His contemporary fantasy series The Case Files of Justin Fearsson begins with Spell Blind from Baen Books and continues with His Father's Eyes. Coe lives with his wife and their two daughters in Sewanee, Tennessee.